An excellent example of a Sunseeker 46 Portofino. The cockpit has a large seating area making this boat ideal for a large family or group of friends to enjoy together. Plenty of room to lounge either in the cockpit or on the foredeck cushion. There are two cabins with two ensuites. The master cabin is situated forward to give the ultimate comfort and space for the owner with its walk around island bed and ensuite bathroom. The twin cabin is situated to the aft and also has an ensuite. This boat boasts a fully equipped galley and saloon. The interior has a cherry-wood finish, cream leather sofa and cream carpet. It has three TVs, one in each cabin and one in the saloon area. 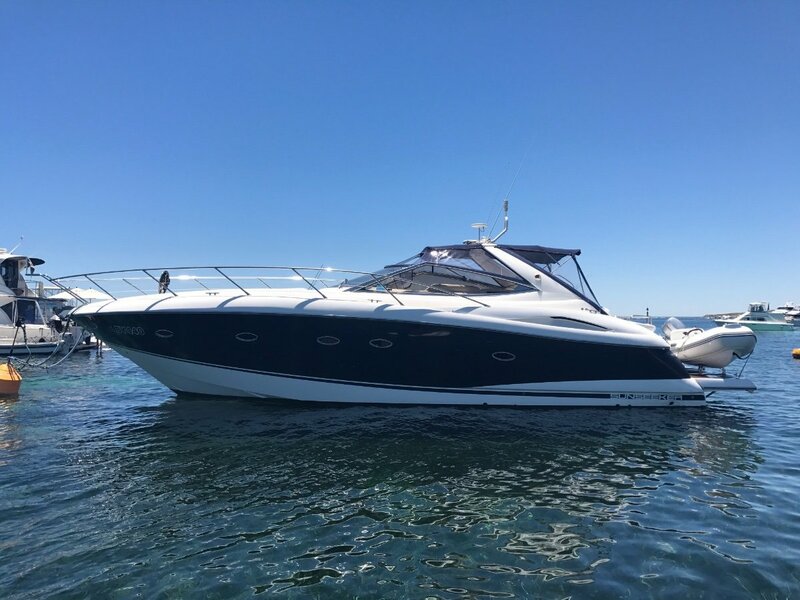 The Sunseeker Portofino is a perfect boat for day trips or an extended stay at Rottnest. For more information on this vessel please call Evan Moore on 0408 606 770. At One Brokerage we pride ourselves on personalised service. Whether you are looking for a new boat, pre-owned boat or a boat share we can help. We are dealers for Fairline Yachts, Regulator Marine, Horizon Yachts and Boat Equity. With offices in Perth and Sydney we can cover an Australia wide market. Our services include brokerage, syndicate management, berthing, insurance and maintenance.